You can find all the information you need regarding New Jersey individual tax filing as well as tax credits and benefits for current and former military personnel. Thank you for your service. We appreciate the men and women who serve in our armed forces. The Wounded Warrior Caregivers Relief Act provides a tax credit to qualified family caregivers who take care of a military service member who has a disability arising out of service in any war or conflict on or after September 11th, 2001. 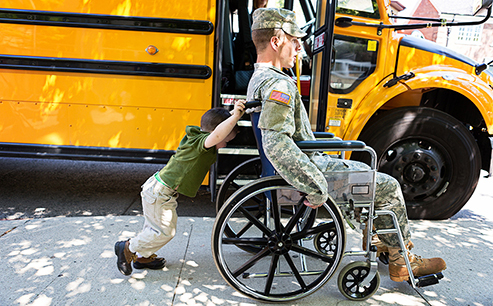 The credit is equal to 100% of the federal veteran disability compensation, or $675, whichever is less. You are eligible for this credit if you provided care for a relative who is a qualifying armed services member and your gross income was $100,000 or less (married, filing joint; head of household; qualifying widow(er)) or $50,000 or less (single; married, filing separate). Complete Schedule NJ-WWC to calculate the credit, and enter the amount on Line 60. If two or more people care for the same person, the credit is apportioned based on the share of total care expenses for the year. If you are not required to file a New Jersey Income Tax return, you can claim this credit by completing the State of New Jersey, Property Tax Credit Application, Wounded Warrior Caregivers Credit Application (Form NJ-1040-HW) . If you are a mental health care professional who provided counseling through the Gold Star Family Counseling program, you can take a credit to reduce your tax due. The amount of the credit may be equal to the amount documented annually by the Department of Military and Veterans’ Affairs for the Gold Star Family Counseling Program. However, the credit cannot reduce your New Jersey Gross Income Tax liability to an amount less than zero.